1959 El Camino: The Beginning of a Legend. Edward Plazek is a Chevrolet enthusiast who lives in a family of mixed make and model loyalty. He was raised in a Ford environment so when he showed his first interest in Chevrolets, his father was a bit distraught! In his youth, Edward was prohibited from purchasing a Chevy because of lack of storage space in his parent’s garage. 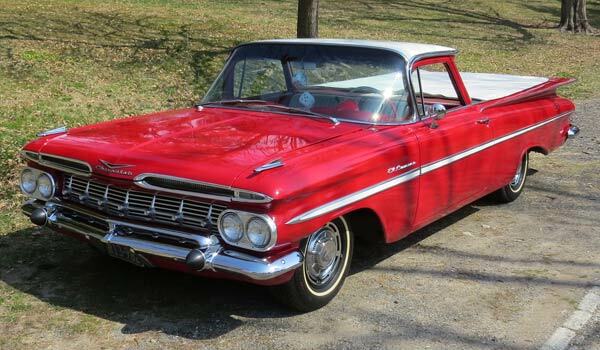 Edward not only liked Chevrolets, his greatest want was to find his favorite model; an older El Camino – preferably the very first year – a 1959 model. After all, this year marked the beginning of a legend. Oh sure, the El Camino would take a three year hiatus after only two years of production, but then it would resurrect in the Chevelle body style for 1964. <img class="alignleft size-full wp-image-2596" src="http://blog.elcaminostore.com/wp-content/uploads/2016/03/1959-El-Camino-interior.jpg" alt="1959 El Camino interior" width="350" height="350" srcset="http://blog.elcaminostore.com/wp-content/uploads/2016/03/1959-El-Camino-interior.jpg 350w, http://blog.elcaminostore.com/wp-content/uploads/2016/03/1959-El-Camino-interior-150×150.jpg 150w, http://blog.elcaminostore.com/wp-content/uploads/2016/03/1959-El-Camino-interior-300×300.jpg 300w, http://blog.elcaminostore.com/wp-content/uploads/2016/03/1959-El-Camino-interior-120×120.jpg 120w” sizes=”(max-width: 350px) 100vw, 350px” />Finally, in 1990, Edward saw this ’59 advertised in a South Dakota Auto Trader and again in Hemmings Motor News. Edward’s dream of owning an El Camino was about to come true. All he had to go by were photos of the ’59. He knew that this truck had been somewhat restored in 1989-90 as part of a radio station’s 30th anniversary promotion in Madison, SD. Edward did not have the time it would take to travel from his home state of Pennsylvania to South Dakota for a first hand inspection, but he decided it was worth the risk. The car was loaded on a flatbed and was on its way to Pennsylvania. 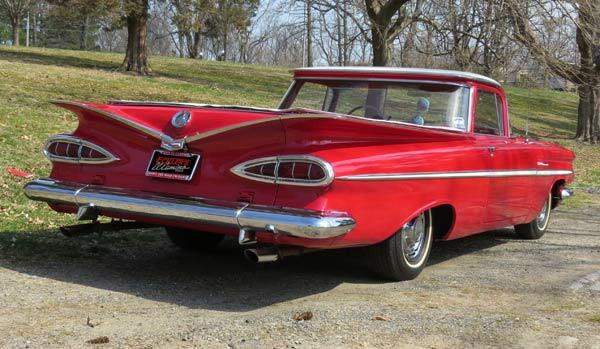 After years of waiting, the ’59 El Camino was really being delivered to his doorstep! Edward could hardly wait to check out his new truck. He knew this was not going to be a show stopper; after all he had bought it to drive and enjoy. As Edward himself puts it, “It was a nice 20-footer”. We all know what that means. The engine was tired, both front and rear floor boards were rotten; the ball joints were shot and the upper a-arm bushings were missing. After a quick once over, Edward knew that there were several repairs needed before he could even think about driving his new El Camino. Over a period of several months, Edward made the repairs and upgrades to his truck. The ’59 is now reliable and driven to many local car shows each year. This ’59 El Camino is still powered by a 283 ci small block with a 2 bbl carburetor and automatic Powerglide transmission. A modified dual exhaust system was added that exits out the back instead of behind the rear wheels. One of Edward’s dreams for the future is to install a 348 ci engine. A good portion of the stainless trim on the El Camino has been straightened and polished or upgraded. The ’59 features a mild red and white roll and pleated interior and of course, fuzzy dice! Edward is a member of the New England Chevelle and El Camino Club. In addition to his ’59 Elky, Edward also owns 1986 El Camino SS. Edwards very first car? 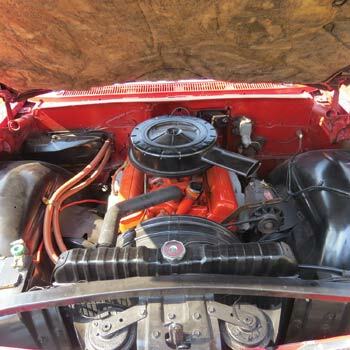 A 1976 El Camino. 1959 was clearly the hottest year For THE Impala and El csmino. I can’t imagine how they got that rear tail light curve! It is one fine sutomobile! Without question. If you had to assign a role of the most stylish and elegant designs. The 1959 El Camino would be near the top.